The objective discussed in this article is to post messages to a CometD Bayeux Channel with a standalone Java Class – without dependencies on CometD. For example to control from Java the Slideshow introduced in the synchronized Slideshow demo application created using CometD (see previous articles Push based synchronized Slideshow demo application implemented using CometD and jQuery running on Tomcat and Publishing to CometD Bayeux Channel from inside the Oracle Database â€“ PL/SQL based push to CometD Web Client ). 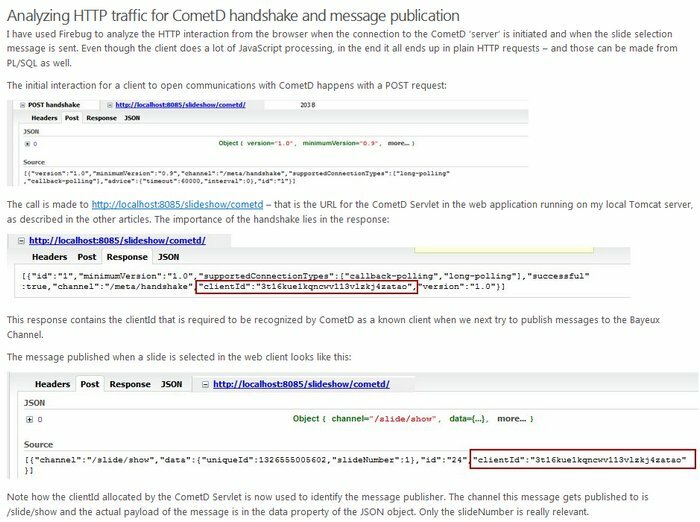 This article describes the creation of a simple Java Class leveraging Apache HttpClient to post HTTP requests (JSON messages) to a CometD Bayeux Channel. The main point is to show working code with the lest dependencies, not an optimal program (it is far from optimal). 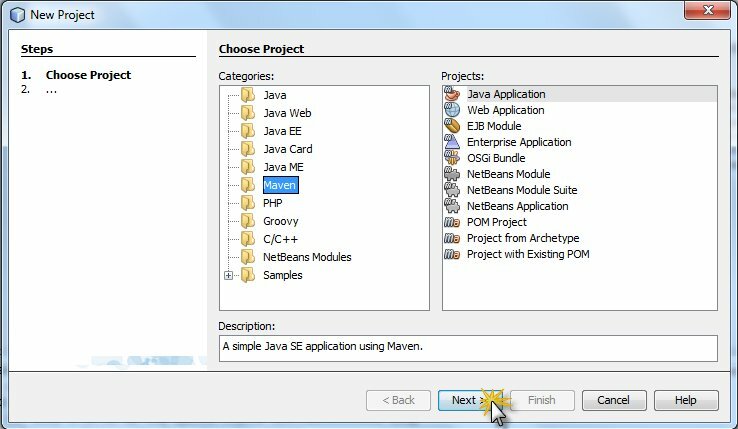 The article demonstrates how NetBeans and Maven conspire here to make the task as simple as possible. The Maven support in NetBeans allows me to simply create a new Maven style project of (arche)type Java Application. 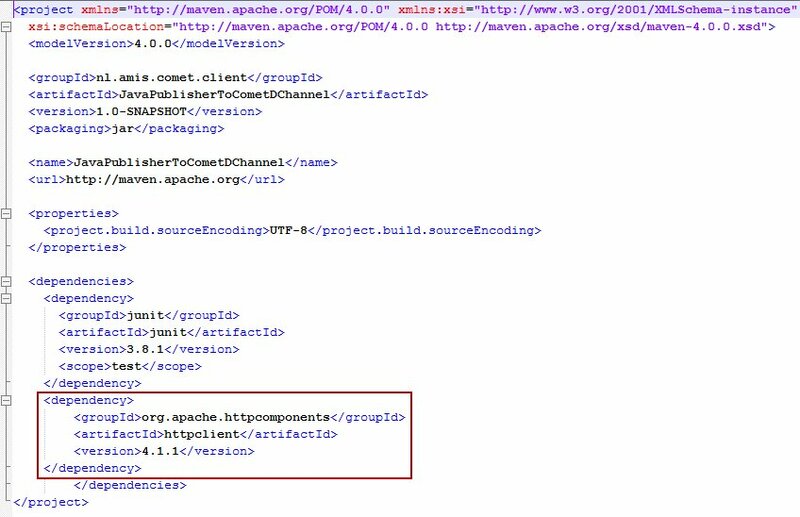 I can then add the dependency entry for Apache HttpClient to the pom.xml. When I next Build the NetBeans project With Dependencies, the required JAR-files are downloaded to my local Maven Repository (see this article for getting going with Maven:NetBeans 7.1 â€“ JavaFX 2.0 support, refactoring enhancements and great Maven 3 integration and Preparing your environment for modern open source Java libraries and frameworks using Git and Maven, throwing in Tomcat as a bonus ). Using the example code from the article mentioned below in the Resources, it is a breeze to make a POST request with JSON payload. After figuring out the JSON messages required by CometD – one for handshaking and one for publishing the slide selection message – as is described in Publishing to CometD Bayeux Channel from inside the Oracle Database â€“ PL/SQL based push to CometD Web Client ), it is just a short step to control the slideshow from Java with two simple JSON messages. Download NetBeans project described in this article: JavaPublisherToCometDChannel.zip.